Mayor Walsh welcomes ex-Red Sox Curt Schilling before his announcement on prohibiting tobacco in city sports venues. NEW YORK — Mike Napoli quit chewing tobacco during the winter but picked up the habit again a few weeks into the baseball season. For him, playing wasn’t quite the same without it. But Napoli supports the Boston ordinance proposed by Mayor Martin J. Walsh that would prohibit smokeless tobacco at city athletic venues, including Fenway Park. “I totally understand we’re role models for kids and kids shouldn’t be doing that,” Napoli said Wednesday before the Red Sox played the Yankees. “I’m an adult and it’s a legal product, I feel like I should be able to do it. But I will follow the law if there is one. If enacted, the ordinance would become effective next April 1. Violators would be fined $250 per offense and signs would be posted around Fenway, including the clubhouse. San Francisco has enacted a similar ordinance that will go into effect next season. 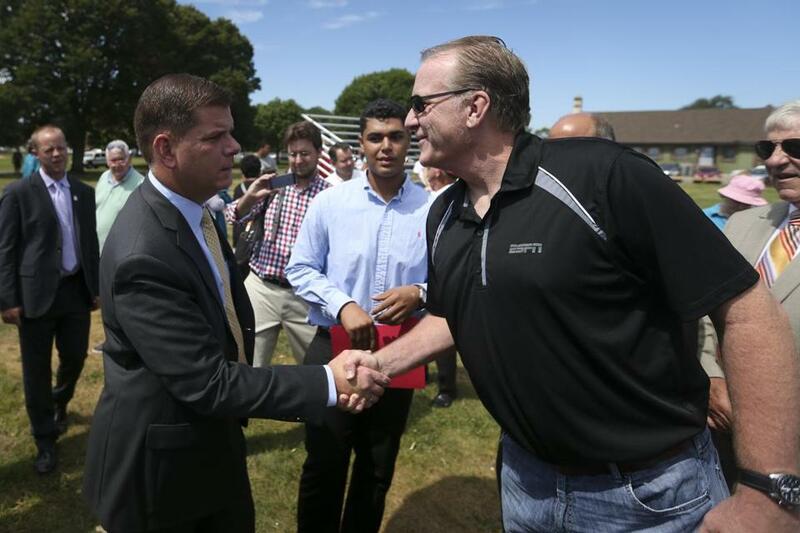 Red Sox manager John Farrell, a tobacco user, said he supported Walsh’s efforts. But, like Napoli, he wondered how it would be enforced. Tobacco use is prohibited in the minor leagues. A ban in Major League Baseball would have to be collectively bargained. A day after four relievers allowed 10 runs over three innings, no changes were made to the composition of the bullpen. The Red Sox did have options. Righthander Heath Hembree, lefthander Edwin Escobar, and righthander Noe Ramirez are with Triple A Pawtucket and have varying degrees of major league experience and worth. Righthander Jonathan Aro, righthander Ryan Cook, and lefthander Tommy Layne also are on the 40-man roster but were recently optioned and are not yet eligible to return barring a major league player going on the disabled list. Another bullpen candidate, Matt Barnes, is now in the Pawtucket rotation and started against Syracuse on Wednesday. Barnes allowed four runs on five hits over 3⅓ innings with three walks and two strikeouts. With Brian Johnson on the minor league disabled list with an elbow injury, the Sox need starter depth and turned to Barnes. “We’ve taken a number of trips to the big leagues with Barnes in the bullpen role. I can’t tell you at this point we would not see him here in a starter’s role but we’ve got to get him stretched out first,” Farrell said. Wednesday was Barnes’s first start since May 1. The former first-round pick was developed as a starter but so far pitched in relief in 26 career major league appearances. The Rays claimed Daniel Nava off waivers. The outfielder was designated for assignment on July 28. Nava, 32, is a career .267 hitter but hit .152 for the Sox this season. He was in the organization for parts of eight seasons after being signed out of an independent league. For the second straight night, Napoli and Alejandro De Aza were in the lineup instead of rookies Rusney Castillo and Travis Shaw. At 28, Castillo is not really a prospect, but is a player the Sox are trying to learn more about. De Aza is a veteran of eight major league seasons and like Napoli will be a free agent after the season. Despite the Red Sox being out of contention, Farrell has been steadfast in giving playing time to both veterans. Farrell said Castillo would start on Thursday against lefthander CC Sabathia. David Ortiz caused a minor New York City media uproar on Tuesday when he was asked about the comeback season of Alex Rodriguez following a drug suspension. “The guy is playing the right way now — as far as we know,” Ortiz said. “He’s having a good season and doing the right thing. I guess that deserves credit.” Ortiz was portrayed as questioning the legitimacy of Rodriguez’s accomplishments, something he forcefully denied on Wednesday . . . The Yankees optioned righthander Caleb Cotham to Triple A to make room for righthander Luis Severino, who started. New York also signed utility player Garrett Jones to a minor league deal. He was designated for assignment last week.